Ce condo au 3ème étage, construit en 2008, a été acheté et mis à jour en 2013. 2 chambres / 2 salles de bain, 2 balcons dont un privé, terrasse sur le toit! Il est à seulement 1. 5 blocs de la plage et du centre ville de Tamarindo, mais est une société privée située dans une rue calme avec rien mais la nature dans le Nord et l'Est. La belle piscine profonde de 6 pieds dans la cour herbeuse est merveilleux pour se détendre. Cette location comprend tous les équipements de cuisine, wi-fi, 2 câble à écran plat T. V. 's, lecteur DVD, station d'accueil I-pod / haut-parleurs (i-phone 5 ou câble auxiliaire), coffre-fort, service de ménage gratuit une fois par semaine et climatisation dans les chambres et le salon Le complexe dispose également 24 heures de sécurité et la clé d'accès à l'entrée complexe. Les deux chambres sont équipées de grands placards avec stockage intégré. La deuxième chambre a deux lits jumeaux qui peuvent facilement être combinés avec un ensemble de feuilles roi fourni. Ce condo fonctionne parfaitement pour deux couples ou une petite famille. Tamarindo bénéficie 40+ restaurants délicieux (beaucoup de DROITE sur la plage! ), Une étonnante longue plage de sable blanc, ambiance conviviale et une vie nocturne animée. Décembre 2013 - Neuf rideaux de douche, tapis de bain, serviettes, etc. Deux salles de bains sont identiques Grande douche, de stockage et d'espace de comptoir. Nous sommes constamment à jour notre unité et nous espérons qu'il répond à tous vos désirs et besoins :) service de nettoyage env. tous les 3 jours. 24 heures de sécurité. Coffre-fort dans l'unité. Another great year at this condo. The condo has everything to make your stay wonderful. Chris is very attentive to any our questions or concerns. 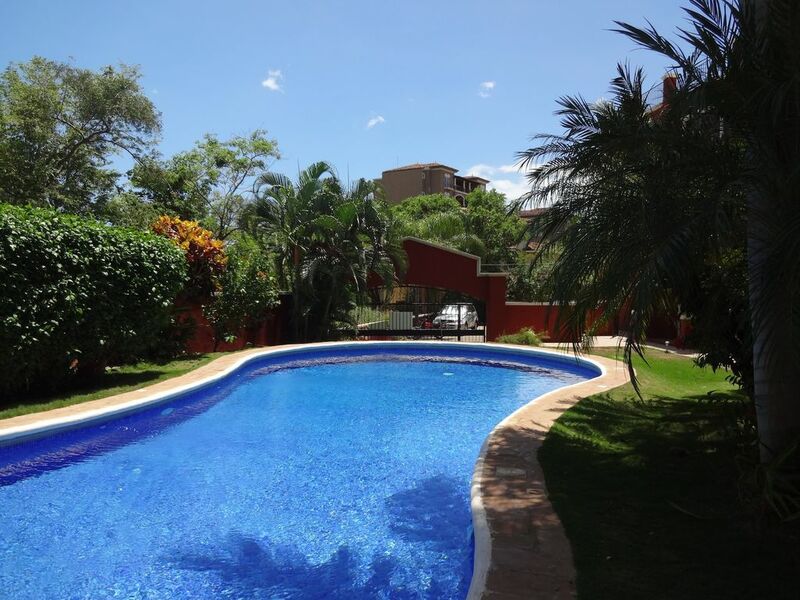 We stayed at the Balcones del Pacifico oct 29 to nov 6 The condo and location is perfect.Beautiful pool. This is our second time here. I hope to return in the spring. Wonderful stay, weather perfect!! We were a little spoiled by the previous places we stayed in Costa Rica (Sta Elena and La Fortuna). The exterior looks nice, but the building needs maintenance as there are broken tiles and motion activated lights that don't work consistently. Parking is limited to about 7 vehicles for the entire building and one vehicle blocked about three spaces so we had to park our rental on the street for one of the nights we were there. The biggest positive was that it was within walking distance of the beach. The kitchen was stocked with plenty of items to cook with, but the sponge left behind to wash dishes was disgusting so we replaced it with a new one. There was a lack of medium size drinking cups. The air conditioner in the main bedroom didn't seem to work compared to the other two in the unit. One of the toilet seats was broken when we arrived. We told them about that after we left and hope it was fixed. One of the other reviews complained about the sliding doors for the closets. That issue has not been fixed and appears to be worse. The doors are off the tracks and are difficult to move. To the owner, the painting of the wave in the main bedroom is upside down. I'm surprised nobody had ever noticed that. If I went back to Tamarindo, I would be willing to pay more for a better place. For those of you who are not Canadian, the deposit is in Canadian dollars, so you might either make money or lose money when you get your deposit back based upon exchange rates. The owner has no control over this. This is just a warning to other travelers to not be surprised when they get their deposit back and see a different amount than what was originally paid. Taxes on rentals are high in Costa Rica, about 30%. I don't know if all rental sites and all rental units include that cost up front. There are ways on these sites to determine the total cost with taxes, so I recommend you use that feature to determine if taxes are included in the up front rental cost. We loved the location of the condo, just 5 minutes walk to the beach and the main street. The building was clean, nice pool and very quiet and safe at night. The condo was exactly what we saw on VRBO. It was clean but the fourniture needs a lot of love and updates and the carpets need to be cleaned and or vaccumed hard. The washing machine was very practical. no hair dryer but I brought mine just in case. The pressure in the shower was not good but it was the same problem everywhere in Costa Rica. Anytime we had questions we had a response very quiclky and it was really appreciated. we did have one negative thing about the condo. We found and killed a lot of ants. we put some spray but the problem was still there. Overall we liked our experience and we do recommend this condo. Hasta Luego!!! Benoit, Elisabeth and Laurence. Excellent facilities, clean, great location, very responsive owner and management company. One of the easiest vacations i have ever taken. Place was great, perfect for a family or a group, great pool and rooftop terrace and so close to the beach. We loved being able to walk everywhere in town as well as to the beach. The pool is very clean and the maintenace staff for the complex work daily to keep the grounds looking lovely. There is a security guard all night so it’s very safe. The beds were comfy although the pillows a bit firm and although the living room furniture is tired and stained it is comfortable. The view from the balcony is beautiful but beware you go up a lot of stairs to the 3rd floor. Not having a clothes dryer in the unit was a little tough as well but we were able to use the complex’s dryer near the main entrance. We enjoyed our stay. Thank you. Ce est aa grande plage pour ceux qui veulent apprendre à surfer! Facile, vagues déferlantes, et beaucoup d'instructeurs sur la plage d'attente pour vous donner votre première leçon! Renters can easily and securely pay online with their credit card, through VRBO. Quick and convienient!! Prices are as shown. No additional taxes will be added on our end. Their is a refundable damage deposit of $250, payable online or in person, if requested. DISCOUNTS available for rentals over 1 month during low season!